Oh Dog! I am helping out the Panda Kindergarten after they’ve managed to get themselves in trouble……. again. You can follow the rest of the tale at The Panda Chronicles. It’s a fun blog, so check it out! Panda caretaker Anne Belov paints, writes, makes prints, and is the founder of The Institute for Contemporary Panda Satire. You can find her paintings at the Rob Schouten Gallery, her cartoons on The Panda Chronicles, and her new book here. She also writes regularly for The Whidbey Life Magazine, a free journal of art and culture on Whidbey Island. She is excited to have the panda kindergarten…um…invade Rumpy Dog. At the very least, it’s gets them out of her house where they are known to be…um…naughty. « Scout and Zoe’s- Treats for Dogs With Allergies! That is cute – nice sled team, but gee Rumpy I think you need to lay off the cookies – you looking a little chunky in the picture!! Wow! It’s so nice to see you being on the cartoon which is very funny and cute! I didn’t know that you have Panda friends, too Rumpy! I hope you go check them out Kevin… but be careful! Those are some very naughty pandas! Such a cute group of visitors. I’d hide them from evil pandas as well. Did they get cuppycakes? As long as there’s cuppycakes at the finish line! Shhhhhh!!!! I’ll blame June Buggie! These pandas are adorable!!!!!! I love comics, just the artwork alone, will have to check her out! How cute – Mom loves pandas. We will go check out that blog. Thanks! The pandas love visitors. Hi Rumpy! Thanks for hiding the panda kindergarten from Mr. wu’s mom, who is not really evil, she’s just mad. (and who wouldn’t be? Those are some VERY naughty pandas.) I’m sure they’ll win the Iditarod, though. Pandas are very optimistic by nature. 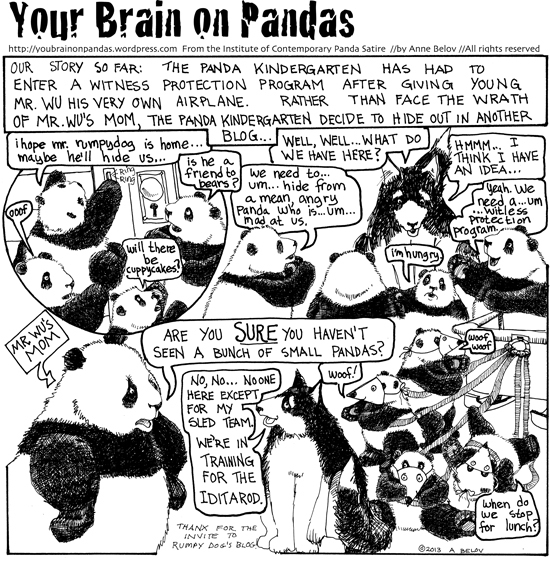 (We have to be, we’re endangered, you know, and the panda kindergarten is PARTICULARLY endangered because they are so naughty.) Um…sorry we ate all your cookies! Da Sooperpanna TRIED to calm down auntie Bai Yun after dis latest debac……er…..escapade, but she is really steamed! Poor cuzzin Wu is grouted forebber, and I fink dat unkie Gao Gao is in twubble too. Dat auntie Bai Yun can be a real BEAR sometimes! Please don’t tell her where we is, Uncle Tai. We has an even more fun idea, and as soon as we can send a message to Mr Wu, we think he will be ready for another adventure with us. ‘kay? Wow, what a great, fun blog about pandas. Thanks for sharing x.
BOL that’s brilliant and what a good idea to hide them as a sled dog team! You are so wise! How kind of you to hide those naughty pandas!